Back in August I mentioned that Pilot Getaways Magazine feature Door County as one of their destinations for their July / August issue. Since Door County is one of my favorite places to fly I enjoyed seeing their take on it. For the most part I think they did an excellent job as usual, though they missed out on two of my favorite sites. So I sent the editor a note mentioning that they overlooked two great aerial sites for pilots flying over the Door County Peninsula, corn mazes and shipwrecks. I just received the September / October issue of Pilot Getaways Magazine and was honored to see my letter to the editor included as well as a photo I shot this summer of the local corn maze. The Chicago Aviation Meetup Group August event was a tour of the Chicago Executive Airport control tower. Chicago Executive (formerly Palwaukee) is a Class D airport with three active runways. Although on Saturday only two runways were active as runway 6/24 was partially underwater from recent storms in the area. There were five other group members that joined me for the tour. I believe I was the only certified pilot in the group but several members were working on their pilots license while others are thinking about it. When we arrived there were three tower controllers in the tower one that was on a mandatory one-hour break and the one managing aircraft on the ground and another managing inbound and outbound aircraft. Luckily there was not a ton of traffic so the controllers were able to talk to us and explain what they were doing for the few aircraft that were maneuvering on the field or in the surrounding airspace. One of the controllers showed us the light gun that is used to communicate with planes that are having radio communication problems. He asked if I had ever seen it in use which I have not. He mentioned that next time I am flying if their load is not to much to ask and he will shine it for me to see from the plane, which supposedly it is very easy to see at day or night. So I have added that to my next flight to-do list. This was my second visit to a control tower and I have found both visits to be enjoyable and educational. 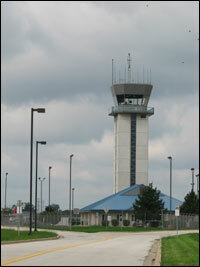 I highly recommend a control tower tour for any pilot or pilot in training. If you are in the Chicago area and interested in meeting up with other aviation enthusiasts check out our aviation group on Meetup.com. I recently became the manager of the Chicago Aviation Group at Meetup.com. The point of the group is to bring local aviation enthusiast together once a month to talk about aviation or embark on some sort of aviation adventure. We have scheduled our first get together for Saturday, August 25th at Chicago Executive Airport (Formerly Palwaukee) where we will take a tour of their control tower. For pilots it is a great learning experience to see what the Controllers life is like. While I was training for my private pilots license I toured the tower at Lunken Field in Cincinnati and found it very beneficial. For an aviation enthusiast it is a rare opportunity to see how a controlled airport works and how the airport tower controllers manage the airport operations. If you are interested in joining the Chicago Aviation Group visit the group page on Meetup.com. You can learn more about this first event on the event detail page. I thought I would share a photo of my favorite new aviation enthusiast TallyDog. 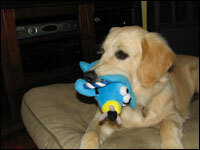 She is seen here playing with her new favorite toy, a plush bi-plane, which we have named "Barney the Barnstormer". Tally is my six month old Golden Retriever puppy. She is named after my favorite little town in Alaska, Talkeetna. Talkeetna is home of a great general aviation airstrip and Talkeetna Air Taxi which offers amazing site seeing flights of Denali is based there. Supposedly Talkeetna that inspired the fictitious town of Cicely from Northern Exposure. I am not sure if I will push aviation further on her and get her in a plane anytime soon. I have always kind laughed in the pilot catalogs with those headsets made specifically to protect a dogs ears like Mutt Muffs. I have often been disappointed in the lack of quality aviation themed apparel. Every pilot has seen in every pilot shop they have ever been in the lame ladies t-shirt that says "Remove Before Flight" or the men's boxer shorts version with the same phrase. At every air show there is booth after booth of military themed t-shirts with loud designs and of course you will also find the tasteless t-shirts as well. I always enjoy it when I can find aviation apparel with a nice clean and simple design that communicates my love for aviation without clashing with any other item of clothing. That is why I was so excited when I stumbled upon Red Canoe Brands. Sure the name does not give away that the company would have a strong focus on aviation themed clothing, but they do. Half their inventory is part of their National Heritage Brands line, which is a line of Canadian heritage apparel. 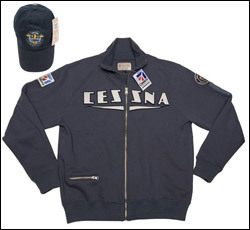 The other focus is in vintage aviation apparel mainly using logos from companies like Cessna, De Havilland, American Airlines, Austin Airways and Stearman. They have a nice line of t-shirts, sweatshirts and hats. I like to wear a hat when I fly to help with the sun and to be a buffer between my head and my headset. I noticed they had a nice selection of hats including a De Havilland branded hat. I thoroughly enjoyed a flight in a De Havilland Beaver while in Alaska a few years back so I decided that would be the right one for me. I rounded out the order with a Cessna sweatshirt. Though, I have a feeling I might be back to pick up a vintage looking Cessna Stow Bag. I have a 45-minute daily commute on Chicago's El. Lately, I have been taking advantage of the time to watch aviation videos on my video iPod. There are several sources of videos that I have enjoyed thus far. I started off by downloading iSquint which allowed me to easily convert my Sporty's Private Pilot Flight Training Course, a series of six DVDs dedicated to the techniques and knowledge needed to earn your private pilots license. These were a powerful resource while learning to fly and I continue to refer to them from time to time to keep current. Sporty's recently created a Download Center on their site where training videos can be downloaded for use on personal computers or mobile devices. I downloaded the 25-minute Descent & Landing Air Facts video. I enjoyed the content and having the ability to watch it on my iPod but wished they could provide this quality content for less than $9.95, which is a bit steep for less than 30 minutes of content. For more than a year I have been enjoying Jason Miller's "The Finer Points" aviation podcast. I have always enjoyed listening to his podcasts during my commute. From time to time his podcast includes video content as well. He recently launched a new site, OnTheFlightLine.com, where he is publishing some aviation videos. So far there is limited content there but I look forward to seeing future videos. On Wednesday I attended an advance screeing of the the award-winning IMAX Film, Fighter Pilot Operation Red Flag, that debuts in Chicago today. While living in Cincinnati I saw a promo for this but never had the opportunity to check out the film. 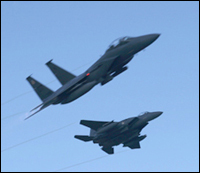 The movie follows Captain John "Otter Stratton", pilot of a U.S. Air Force F-15, through his experience at the Red Flag Training program at Nellis Air Force Base outside of Las Vegas. Red Flag is a two-week, realistic combat training exercise that involves the best pilots from our Air Force and allied air forces like Canada, Germany, and the United Kingdom. The goal of Red Flag is to maximize combat readiness, capability, and survivability of participating units through realistic training. The film takes full advantage of the large screen format of the IMAX theater. Director Stephen Low explains how this is different from traditional aviation films, �So many films on fighter aircraft essentially fake the interaction between the planes using a lot of quick cutting, simulated cockpit photography, and special effects. Working with the Air Force made it possible for us to shoot actual dog-fighting for the first time between a dozen aircraft at once. Altogether we were working with more than one hundred aircraft of all types. This is the closet an audience will ever get to flying in the middle of a massive air combat mission." Low is exactly right, as the film made me feel like I was right in the heart of all the action. I flew along during simulated close contact air-to-air combat missions, simulated bombing runs, humanitarian food drops, and rescue missions. Fighter Pilot: Operation Red Flag, winner of the Large Format Cinema Association 2005 "Best of Festival", opens in Chicago at the Navy Pier Imax today. The IMAX Theater at Navy Pier is "Chicago's largest flat movie screen-a soaring six-story, 60 x 80-foot screen designed to enhance both 2D and 3D films." Anyone with a nugget of interest in aviation will love this film! I have been doing a fair amount of commercial traveling as of late and often find myself in the airport terminal bookstores. Out of the corner of my eye I spotted a book with an airplane on it and the title "Solo: My Adventures in the Air" by Clyde Edgerton. On the back cover was a quote from Men's Journal "Either the best living novelist to fly planes or the best living pilot to write novels". Since I love aviation and enjoy reading about aviation related books I decided to hand over my $12.95 to find out if this was true. I just finished reading Clyde Edgerton's Solo less than a week after picking it up. The book takes you through Edgerton's flying experiences starting at age four with a visit to a local airstrip, to flying in the United States Air Force and finally to his flights in a PA-12 Super Cruiser he named "Annabelle". The book was an enjoyable read if you are a pilot or an aspiring pilot I recommend you check it out. I plan on looking at some of his other titles in the near future. As for my own flight adventures...I plan to return to the wild blue yonder on Saturday.